An ikat is made by dyeing a pattern into the yarns before its woven into a fabric. 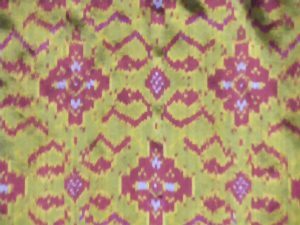 You can pick an ikat fabric from a printed fabric because the surface design is created in the yarns rather than on the finished cloth, and in an ikat fabric the design appears on both the front and back of a fabric. Its known as a resist dye method - other resist dye methods are tie dye and batik - but in these processes the pattern is created after a fabric is women. While it is not known exactly when or where the first ikats were developed - South East Asia, India and Central Asia have a very long history with the technique. In fact ikat patterns can be seen in cave paintings in India dating back to the 5th century and a fragment of fabric that can be found in the Tokyo Museum can be traced back to the Tang period in China. Cotton textiles with simple ikat stripes were made in Yemen by the eighth or ninth century. Early ikat textiles can also be traced back to pre-Columbian South America in Peru and Chile were indigo ikat textiles were produced. However its not clear if the processes used here were developed here or were introduced through trade routes from South East Asia. Ikats were also produced in West Africa, including Ghana, the Ivory Coast, and Nigeria and in the Europe ikat textiles appeared first in Italy in the 17th century. From the 19th century onwards Asia has produced the most varied and highest quality ikats. The ikat pattern is formed by binding bundles of threads with a tight wrapping - these days this wrapping material can be anything from other plant fibres like banana to commercial plastic tape. The bundles of threads are set up on a frame to assist forming the pattern - the yarns are then dyed - the binding is then tied again in another area then the yarns are dyed again with another colour. The process can be repeated many times to produce a multi-coloured pattern.. When the the dyeing process is finished all the binding are removed and the threads are spun onto large spools which are then set up as warps (length-wise) on the loom or are spun onto spindles and threaded through the shuttle as weft (cross-wise) threads . A characteristic of ikat textiles is the "blurriness" of the pattern as the weaver has to line up the dyed threads produce a clear pattern. Generally the finer the thread used the sharper the pattern. There are 3 types of ikat fabrics; the warp; the weft and the double ikat. The oldest and most common type of ikat is the warp ikat where only the warp threads (run lengthwise through a fabric) are dyed and the weft threads (run cross-wise through a fabric) are solid colours. You can clearly see the pattern of a warp ikat from when its threaded onto a loom and the threads are more easily adjusted than other ikat so the patterns are often clearer - although in some places like Central Asia a blurred design is preferred. You can generally pick a warp ikat by its elongated design. In weft ikat the weft yarns (cross-wise threads) carry the dyed pattern - which means that its is a much slower and harder type to weave as the yarns need to be carefully wound onto the shuttle spindles then carefully adjusted each time the shuttle passes across the loom. Wef ikats through history have been closely associated with nobility as the cloth is more valuable because of the skill required to create the fabric. Double ikat fabrics are where both the warp and weft yarns are dyed before being woven into a fabric. These textile are the most rare and prized ikats because of the skill and labour required to produce them (in some places they are thought to have mystical powers). They are produced in Gujarat in India, the Okinawa islands of Japan, the village of Tenganan in Bali, and the villages of Puttapaka and Bhoodan Pochampally in India. In Cambodia you'll find gorgeous weft ikats in both its Sampol Hol skirt lengths and the beautiful intricate pidan clothes which are used in religious ceremonies. In Laos there are many different types of weft and supplementary ikat patterns and motifs used across its different ethnic minority groups. Instead of being called ikat is usually called matmee - which literally means "tie the row". Weft ikat fabrics are mostly woven to produce the traditional tube skirt of Lao women. In Vietnam the northwestern Vietnam ethnic minority groups from the Thai speaking groups like the White Thai produce some unique weft and warp ikats but those from the central and southern Vietnam who originate from the Cham and Malay/Polynesia backgrounds tend to produce more simpler warp fabrics - although the use of supplementary beading in the fabrics of the groups like the Cotu are really unique. 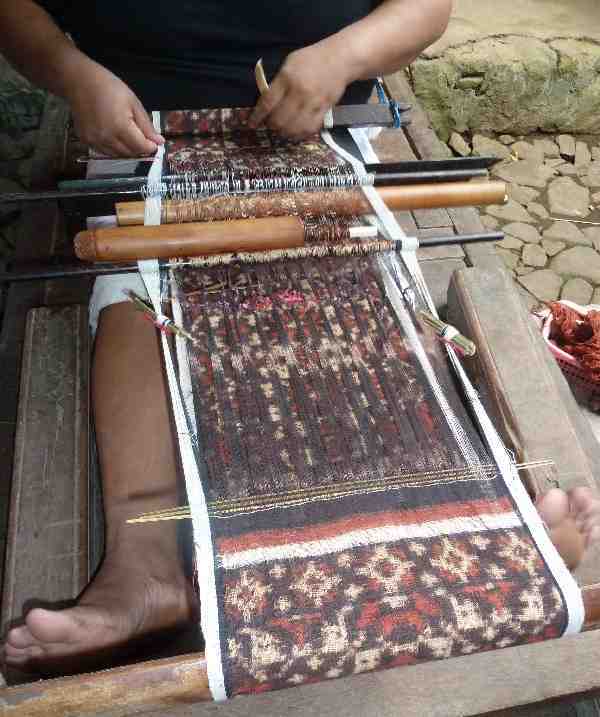 In Bali you'll find lots of different warp and weft ikats and of course the sacred double ikats. 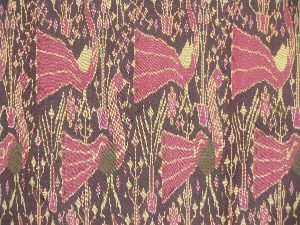 The Songket fabrics are a great example of supplementary weft weave, Endek fabrics are the most common type of weft ikats that you'll see for sale across the island. If you would like to learn the techniques of ikat weaving, we offer a 10 day Independent tour to Laos Shuttles & Spindles of Laos starting at $2,920 per person twin share.